THE worst defence ever presented at the judiciary happened back at the old Phillip St headquarters. 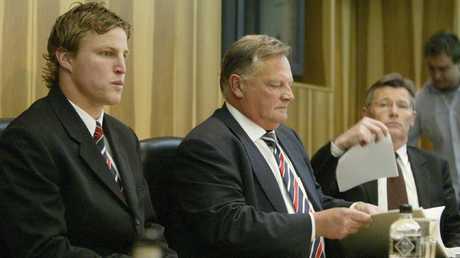 Inside the oak-walled rooms filled with conspiracy and truth walked Martin Masella, the Balmain Tigers enforcer, with his counsel, Balmain chief executive Keith Barnes. They sat down charged with a careless high tackle. 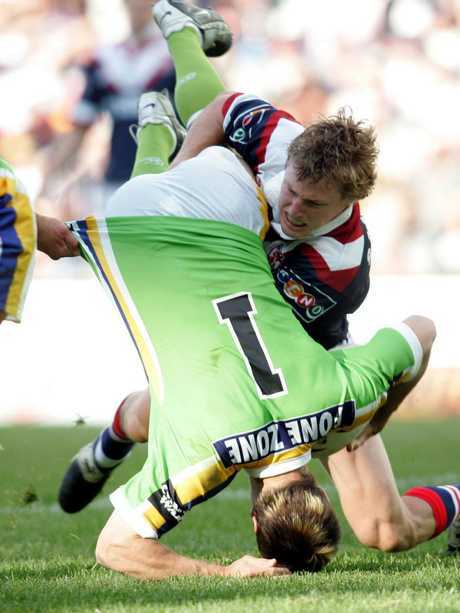 It was the early days of the careless, reckless and intentional high tackle gradings and everybody was still getting used to the new system. The case began like it always did, with Barnes's opening arguments. Barnes began by telling the judiciary panel what a hard working footballer Masella was, a passionate defence, and how the tackle "wasn't intentional, he wasn't reckless, and he might have got a little careless but he certainly didn't intend on injuring the player." At that judiciary chairman Alan Sullivan held up his hand and stopped Barnes from going any further. "Well Mr Barnes, Mr Masella is only here for a careless high tackle." Masella sat confused. Was it already all over? The entire hearing would not have lasted two minutes. 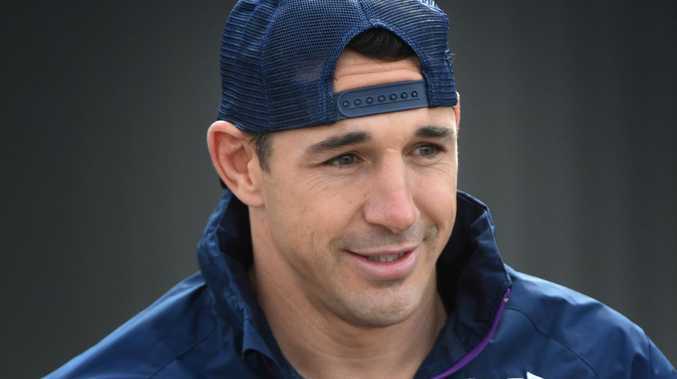 The guilt of Billy Slater begins and ends with how well Melbourne present their case. Monday nights at NRL headquarters, first at Phillip St and later at the Entertainment Quarters, used to be a regular beat for league writers. This was back before early pleas eliminated the need to turn up and every case was heard and, given it was going to be heard, was always fought. Sometimes there would be two and three cases decided in an evening and the difference in the quality of defence was the difference between first grade and State Cup. Some horrible injustices occurred some nights. The worse are poorly handled submissions that fail to deal with the charge itself. It happens more often than you could believe. Even still. I have covered countless judiciary hearings over the years and saw often the difference in the strength of the defence, the correlation between a good defence and a positive result and vice-versa, to give Slater a chance with the right defence. The best defence probably happened in 2004 when another grand final appearance was at stake. Brett Finch looked set to miss the decider when he picked up Clinton Schifcofske and drove him into the ground two weeks in the first week of the finals. The defence that followed was inspired. Finch got pulled in for this one on Clinton Schifcofske. Finch's first witness was Finch. He argued it was a textbook tackle, shoulder in and drive. Finch's second witness was none other than Schifcofske. The Raiders fullback argued that once Finch hit him and began to drive his job was to find the ground as quickly as possible so, he argued, he twisted and dived for the ground. In that state, he put himself in the dangerous position. The rugby league world in uproar the following morning when the radio bulletins led with Finch getting cleared. 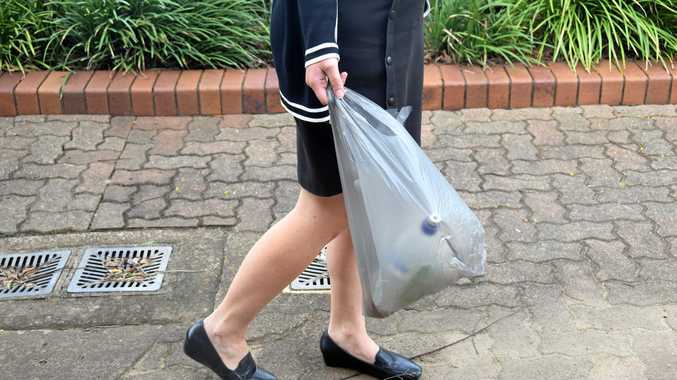 Outraged fans, quick to find a conspiracy theory, were convinced the Roosters had pulled another rort. Somehow, the former Rooster got away with it. Like criminal court, a solid defence can make all the difference. The current criteria for a shoulder charge changed before last season, the NRL releasing the change in February. First, "the contact is forceful". Second, "the player did not use, or attempt to use, his arms (including his hands) to tackle or otherwise take hold of the opposing player". This is where Slater has a defence. The front on replay shows Slater's right hand contacting Sosaia Feki before his body comes into contact. Slater can defend himself on the grounds he did use his hand. And if he did use his hand, it fails to meet the second test of what the NRL claims is a shoulder charge. To that the prosecution will argue the impact was forceful and the force came from the shoulder colliding with Feki. That is irrelevant. Slater can simply explain that is why the hand was there. 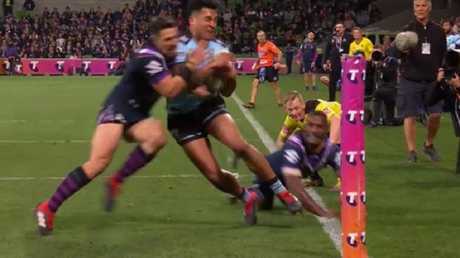 Slater was anticipating Feki stepping inside him, against his momentum, and by the time it became clear Feki was heading for the corner Slater was already in a bad position and simply braced himself for the impact like anybody would in a collision. Arguing the merits of it as a shoulder charge, saying it was not like other shoulder charges or not as the rule intended, will only convict Slater. Emotional arguments that Slater is retiring and should be not rubbed out of the game for such a tackle will also lead to his conviction. It is an emotional argument, as irrelevant as those arguing from the opposite side but with the same logic that Slater should not be given special dispensation because of his achievements in the game. The simple fact is, as skinny as that touch is, Slater does not satisfy the second category for what constitutes a shoulder charge.